I live in Connaught, there are no tracks nearby, what can I do? Don’t worry there is a very active club in your region who regularly compete on the track. For more information please contact Aidan Reade of the Black Rose Cycling Club. Are there any velodromes in Ireland? Dublin Eamonn Ceannt Stadium (colloquially referred to as ‘Sundrive Velodrome). No track racing is extremely safe. All riders must be accredited before they can take part in group activity and all sessions are monitored by our experienced coaches. I want to keep fit but I do not want to race, what can I do? Track cycling is a great way to keep fit and throughout the season our trained coaches hols sessions twice a week. You can take part in these sessions even if you do not want to race. Please check our calendar for the times for these sessions. No for safety reasons road bikes are not permitted on the track. But the good news is that track specific bikes are available for hire at the tracks. I saw track cycling on television. There appeared to be a lot of different types of races. Track racing is divided into two broad categories: the sprint races and the endurance races. A simple surge for the line. For male racers only, the start is from standing and the rider accelerates as quickly as possible to maximum speed, then holds it until the line if possible. The best times for the measured kilometre touch one minute. Tactics do not come into this event, it is purely a test of power and accurate pedalling. A simple surge for the line. For female racers only, the start is from standing and the rider attempts to accelerate to maximum speed before the finish line. The best times for the Tactics do not come into this event, it is purely a test of power and accurate pedalling. The 500m time trial will be introduced at the world championships this year. This was first a world championship race at Cologne in 1895. Nowadays, there is a Sprint category both men and women. A line is marked 200 metres before the finish, and the riders’ times beyond this line are measured. This is why the race is sometimes called the 200m Sprint. Races are contested over a distance of one kilometre, with two riders at a time on the track, jockeying for the best position from which to unleash their final surge at the finish line. The contest uses a knock-out format, and each heat is contested over two races, and if needed a third race is used as a tie-breaker. Tactics plays a key role in the match sprint, and sometimes the cat and mouse game in the early part of the race brings both riders to a complete standstill, which is how the famous cycling ‘track stand’ came about. The reason for this is that nobody really wants to lead. It is generally a disadvantage to have the lead going into the final 200 metres, since the high speeds attained by track racers make the slipstream advantage a significant factor. The match sprint is always one of the most popular types of race at a track meeting. Only men compete in the Keirin. This race originated in Japan, where it is the predominant form of cycle racing. People there go to Keirin meetings and bet on the outcome, similarly to horse or dog racing . There is so much money in the sport in Japan that many of their top Keirin riders do not go to the world championships. And if they did, they might well not win it. Since this race first appeared on the world championships programme in 1980, the only time a Japanese rider has won it was in 1987, when Harumi Honda took the Rainbow Jersey at Vienna. So why do the Japanese not dominate in the race they invented? The Japanese Keirin has some significant differences to the international interpretation of this race. For a start, tracks there are banked less steeply than in most other places, and an all-weather asphalt surface permits Keirin racing in the rain, which would not happen at a world championship or world cup meeting. Furthermore, the approach of Japanese Keirin racers is to win as much money as they can all the time. This means staying at a high level of fitness for several months of the year. To reach the peak needed for success at the world championship would demand a recovery period afterwards, which would harm earning potential. So from the professional point of view, it makes no sense. One final significant difference is that in the Japanese Keirin, riders start the race lined out across the track. In the international version, they start in a single file along the track. So, what happens in the Keirin? Rather a lot, actually. It is regarded as the most physically combative of all track races. A motorcycle paces the field of eight, leading them faster and faster around the track for three laps until it peels off. Then the riders are free to sprint for the finish line. Strength, courage and aggression are required to get the optimum position for the final lunge for the line. Only two riders contest the pursuit, each starts at a point marked half way along the opposing straights of the track. From the start gun to the finish, the purpose of the race is to catch the other rider. If a rider catches his or her rival before the designated race distance, the race ends immediately. Otherwise the pursuit is decided by the rider who completes the distance in the shorter time. The winner passes through progressive rounds in a knock-out format contest. Tactics in pursuit racing revolve around pacing. To start fast, or to finish fast? The best riders keep an even pace throughout. Smooth pedalling style and intense concentration are as important in this sport as the capacity to endure pain. The best times for the men’s four kilometre pursuit are beneath four minutes, thirty seconds. Among the women, any time beneath three minutes, forty seconds for the three kilometres is very good. The Olympic sprint is a men’s race at this point in history. It was invented to conform with Olympic criteria for cycling, and creates a spectacular event that is popular with television and spectators alike. A three lap race, two teams of three riders start from the pursuit markings. Each rider in each team leads for one lap and then takes shelter in the slipstream at the back of his team line. The finish time is recorded when the third rider in each team crosses the line. The first leading rider in each team must be a pure sprinter: able to reach a high speed quickly but not necessarily to maintain it. The rider who takes the lead for the final lap might be good at the kilometre sprint. At the finish of this fast and close-fought race, frequently the gap between teams is measured in tenths or hundredths of a second. The longest of the track races. A bunch of riders sprints for points at the end of each lap. At the end of the race, the rider with the greatest points total is the winner. When did track racing start: Track racing has been around since the last century. The first world championships records date back to 1895.These days, it is a highly structured and complex branch of cycle sport and involves several different races. A track meeting showcases a range of the most dynamic and extreme skills and tactics in cycle sport. The exponents of track racing are cycling’s most muscular athletes. These are the power players, whose image is the embodiment of strength and speed. Recently the track world championships programme was brought into line with the track Olympics programme, making the two annual events identical to the quadrennial event. Not an easy race to follow, but worth the effort of concentration if you do. This race takes its name from the venue of its invention: Madison Square Gardens in New York. Several teams of two men race around the track at the same time, trying to gain a lap on their rivals. The Madison is either thirty minutes or one hour in length, and is effectively a relay race. At any one time only one member of the team is involved in the competition. While one team member races, the other circles high on the track, resting. Normally the rest period takes one and a half laps. When the resting rider rejoins the competition, his colleague slings him into the fray, either by a hand sling, or else by a firm push on the seat. The object of the Madison is to complete more laps than any other team. Points are scored at specified marks during the race, and if two or more teams finish the race on the same lap, as is often the case, the one with the greatest points total wins. The track is available for use by Cycling Ireland clubs for fixed wheel training only. All sessions must be supervised by a Cycling Ireland Coach (preferably track coach). Riders must sign on for all sessions. Maximum time bookable for Club Track Sessions is 90 minutes. This time may be extended at the discretion of the Velodrome Committee if sessions are open to more than one club. Clubs may be asked to share sessions, if demand at that time is high. Private Club Training /Accreditation Sessions can be booked in 2 hour slots. These sessions cost €100 for 10 riders and €5 per rider after that to a max of 24. This fee includes bike hire and two CI Track Coaches. 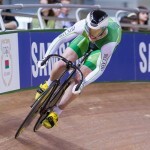 and will appear on the calendar on www.trackcycling.ie. The velodrome email is monitored by representatives from 3 clubs and it is their remit is that the track is available to all those who wish to train there. The track and clubhouse are locked facilities but those on the coaching rota would have keys, so it may be necessary to hire a coach. Sundays 2 hour slots , preferably without dead time between session. (3) Extended times may be allocated depending on the inclusive nature of the session at the discretion of Sundrive Velodrome Committee. (5) Sessions for Fixed Gear Track bikes only. (6) Latest session bookable on Wednesday League nights is finishing at 1730. (7) Requested booking times may be altered to facilitate earlier or later sessions. (8) Preferable to steer well clear of running club as although their sessions are 1845 to 2000 on Tuesdays and Thursdays, technically the whole evening is theirs so be well gone before they arrive and under no circumstances enter until they have left. (11) All Senior/Junior riders using track must pay the 10€ facility fee and submit licences for accreditation stickers at their earliest convenience . (12) Please walk track prior to use and remove any stones, sticks or glass.Also if you tell us where the glass was, we can use the blower when we are there next. One month or two sessions in advance. If multiple sessions required times and dates can be submitted and will be allocated closer to the date. At times of peak demand, clubs may be requested to share sessions for like minded sessions e.g Team Pursuit. Individual or small groups should be inclusive and receptive to requests to share track time, but priority within the session will remain with original booker. Public sessions (e.g Saturday Derny) always given priority. 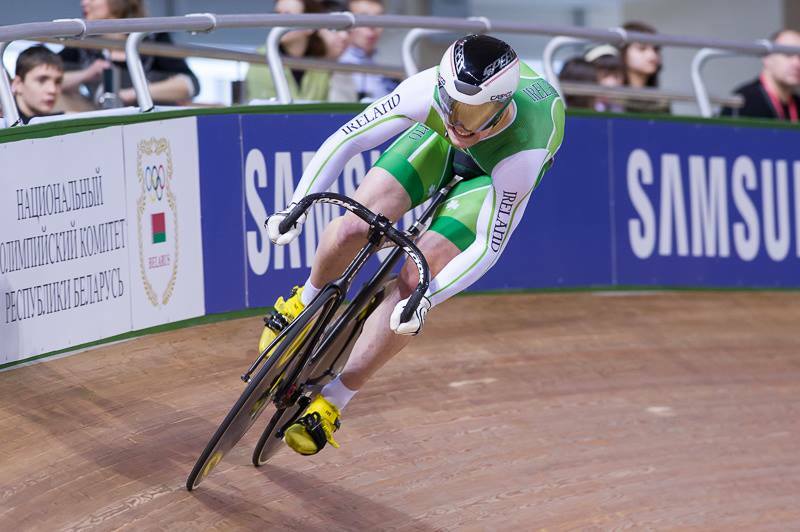 Cycling ireland Squad sessions may be allocated longer sessions. No problem contacting me by text, wattsapp or private email hugh66@eircom.net but please cc to sundrive@trackcycling.ie for transparency. What gear should I use? I have had a few questions regarding gearing etc and this is just info that might be of some use. As a rule of thumb changing the back sprocket by one tooth makes a difference of approx 4 inches, while added a tooth to the front chainring increases your gearing by 2 inches. It is usually advisable to have at least 2 front rings and a few back sprockets. So say for example if you have a 48 & 49 front and a 14/15/16 for the back you would have a good choice of gears for most occasions. Also track rings can be changed quite quickly -5 allen keys that screw straight into the armiture. Rear sprockets come in two basic types. 2 ‘Miche’ -a handier version where the body screws on and the sprocket just sits on this and is held by a lock ring which requires that head set open ring type tool . 2018 Accreditation Dates at Sundrive? Accreditation is the basic level of skill required to participate in training and riders will be required to participate in at least one further full training session and only if can be signed off on some other skills and ability to display those at speed, will then be allowed to race. Friday 8th June 7pm (Extra Date – sign on 1830 to 1850) * Please register at sundrive@trackcycling.ie as 6 participants required!! Gaining accreditation ensures that riders have the basic level of skill required to participate, safely, in training sessions. Riders are then required to participate in at least one further full training session subsequent to the accreditation session in order for the coaches to assess their ability. Should the rider attain the required skills standard they will be ‘signed off’ and issued with an accreditation ‘pink slip’. Once the rider has a ‘pink slip’ they will be allowed to partake in competition. Both stages of accreditation must be undertaken within the same season. Riders with less than 1 years racing experience will be removed from the list after two seasons of inactivity. Attendance at normal training sessions will extend your accreditation status irrespective of whether you race or not. Riders with in excess of 2 years extensive bunch racing experience may remain on the list at the discretion of the Track Commission despite inactivity. Shoes and Helmet are available to hire, limited number available so please bring your own if you have them. Sundrive Pavilion, the yellow brick building located at the entrance to the park, off Clogher road towards Rutland Grove, Crumlin. Sundrive Velodrome, Eamonn Ceannt Park, Sundrive Road, Crumlin, Dublin 12. 150 stops on Clogher road junction of Rutland Avenue. 18 & 83 stops on Sundrive road / Stanaway road. Please dress appropriately for the weather any time of year. Wear layers, gloves, any cycling clothing, including shoes but not essential. If you have cycling shoes, Look Keo cleats compatible. No Changing Pedals or any Equipment on Hire Bikes. If not, Flat sole trainers / runners is preferable. Shorts / Sports / Gym clothing is ideal, jeans or anything baggy not recommended. Separate Male & Female changing facilities available. Bring a drink and some food, banana, small snacks and/or sandwich. Spar is 2 minutes from the track. Tap water available at Sundrive Pavilion. See links to our website and social media pages, all of which will give you an idea what you can expect. This is a pretty good indicator of whether sessions will go ahead!! I’m a track bike enthusiast, I also love racing championships as my family is still in this sport since my grandfather was young. My cousin is a bike track coach back in Brazil, and I don’t know the reason but I have developed the passion for the track bikes just in Ireland. I’m cycling a single speed since always in here (52×16), and now I got a track frame, and I’m buying the other parts, so I’m wondering if I could finish my simple project and put it on the track for fun. I’ve been facing bad times and for sure it’ll make me feel great again. Is that a possibility? If it’s not, what could I do to be cycling on a track? I’m asking because if it does not require high budget I can adapt myself whenever it requires. I do by my own any maintenance on a bike, so my bikes are always well cared.